Many congratulations, you have one very beautiful amazing and extremely special doll. Pearl has more than beauty, she has soul within. I am so happy that more people here are enjoying Lene's wonderful dolls. I hope Pearl brings you good fortune and much happiness. Thank you so much Pianissimo! She is everything you say!! I feel extremely lucky, as though the doll gods smiled on me. Pearl photographs so that every different angle and light creates a new expression. I completely understand when you say you would like to fill your home with Lenes dolls. Vulnerable, beautiful and strong. Thank you I am so pleased to have her. Huge congratulations on this special doll. Thank you kindly Ivdolls! I am so very pleased to have her. 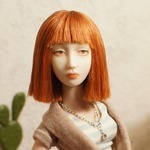 I must say that I feel sad whenever one of Lene's dolls disappears to a new owner, never to be seen again - so it's wonderful to see Pearl on our forum ! Congratulations! It's so nice to read about someone getting their doll and the doll is so much better than expected. Enjoy your beauty and post many photos! Thank you so much Sutton! It was so wow first holding her. And the details of her hands and feet are stunning... thank you again I shall take many pictures! Congrats pb! She is amazing. I am wondering at her narrow hips! She is so delicate looking!! How does she pose? Does she have tight tension? Love that she has shoes! Hi there Allurose I am just seeing this post now! Sorry! She has wide hips and a beautiful bottom! I must take more pictures! Her tension is different, her hips are looser than the rest of her, I believe it reflects Pearl's character. I see her as many things, a Bon vivant, a dancer a beautiful soul at sea, a muse and a visionary. However she poses beautifully. Here are some closer pictures. I just love her. It always amazes me how I feel when I connect with a doll. I am in awe of her and Lenes talent. wow! these are fabulous detailed photos of Pearl, thank you so much for posting them! Her body is very elegant, and her face - oh those eyes!!! They are full of mystery. Lene makes such wonderful eyes.